I after doing some more research on Paul Hanson ("the" electric bassoonist) I found this track with Bela Fleck. It features solos for electric bassoon and electric saxophone. This ballet has a similar structure to the possible structure our group discussed for our piece: contrasting vignettes, each connected but also contained in their own world. I particularly appreciate how distinct the color schemes are from piece to piece; our group hopes to achieve similarly contrasting color schemes. Lastly, I appreciate how although the piece is made up of vignettes, there is a clear narrative: the piece starts more lightly and with pastel colors and ends more seriously with darker colors. Secret Sounds of Spores, Inspace from Yann Seznec on Vimeo. Here is a sound installation that translates the motion of falling mushroom spores to music. I especially enjoy this installation because not only is it conceptually interesting, but it also sounds good. I think it captures the mysteriousness, eccentricity, and intricacy of mushrooms well. The music is hypnotizing, but also active and unpredictable. This music might be useful when our group is considering how to portray mushrooms with music. Here is an online collection of mushroom inspired fashion. Our group is potentially interested in using costumes for our mushroom-themed vignettes. I particularly think that mushroom gills are translated beautifully into the fashion here. I love the natural flow of lines that the mushrooms bring to these pieces, and also the improvisatory shapes that look outlandish in a fashion context. In our group meeting, we talked about live processing instruments. As I was looking for examples, I remembered a concert by Neil Rolnick that I attended a few years ago and starting checking out some of his work. This video helped me see some of the ways in which live processing can be used to introduce musical elements. We discussed that we might want to use Max for some of the live processing. As I was looking for ideas and examples on what can be done with Max, I found Jonny Greenwood from Radiohead using it. This is an example of live processing that primarily deals with timbre, which is different than the Neil Rolnick example. After checking out many examples of processing live instruments, I started to look for different ways of using tech along with live instruments to see some more variety. This is one of the fun examples I've found, which uses samples and beats in a piece that is performed on the piano. One of the things we discussed last class was using instrument sounds to mimic speech/dialogue. An example of this is in Steve Reich's WTC 9/11 (although personally I don't like this piece very much, and there's a lot of ethical baggage in this piece, but that's a loaded topic I won't get into!). But I think the idea of how he uses instruments to play in rhythm with recordings of human speech is interesting. We were thinking of taking this a step further and using live processing to alter the instrument sounds themselves to trigger random, seemingly unrelated noises which could then be played in time to match a dialogue in the narrative in the video accompanying the performance. The specific idea we discussed earlier about having instrument sounds or key clicks trigger other noises is explored more in the track below (which Matthew actually recommended me to listen to last class!). Instead of playing regular trumpet sounds, Mark Kirschenmann triggers other sounds using Logic that each correspond to different notes that he plays on his trumpet. Another idea we talked about was having a piece based on short really fragmented and contrasting ideas mushed together, so that the audience almost gets "whiplash" immediately moving from one random fragment to another. The piece below by John Zorn ("Cat O' Nine Tails") actually doesn't have electronics in it, but it's completely based off of this fragment idea, moving through completely different styles almost every ten seconds or so. In our group, we have been discussing about the sources of inspiration, and one theme that came up was nature. This music is from Diego Stocco, and Italian composer/sound designer. He has made a couple of works on nature and trees, as well as objects and custom made instruments. I like that he is very creative in his ways of capturing tree sounds and creating a variety of textures out of nature. In our group, we have been talking about the possibility of presenting our videos or music in a way that may be provocative to some people. I was looking into different ways that different people present provocative content, and this video leans towards the extreme scale. What I liked about this video was the way the band addresses the audience in the beginning, about how people might be pissed off, but they don't care because this is their opinion. Dead Kennedys is a punk rock band that are known for their provocative lyrics which often involves political nature, political figures and authority. 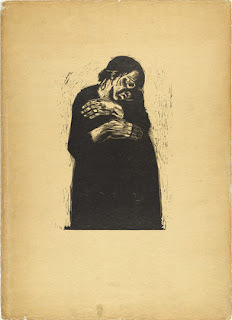 The last piece of work is an artwork by Kathe Kollwitz called War (Krieg), which shows the portrait of a widow. Her portfolio of seven drawings focuses on the impact of the war to those left behind, including widows and children. This is very relevant to what our team is trying to do, as we are trying to visually present the effects of violence and discrimination through many perspectives. In our group we talked about processing live instruments with audio effects racks as a part of composition. While I'm familiar with the majority of the instruments we're using and the sounds they're capable of producing, I've had very little experience working with French Horns and know very little of all the timbres they can produce. This video helped me understand what a French Horn can produce sonically so I can get a better basis of what kind of processing would be interesting. From our discussions on Tuesday, it seems like we're going to be incorporating a fair amount of looping. In the past few years I haven't done much if anything involving looping during live performance. I looked up how live performers, especially bands have been incorporating looping and felt this video was helpful for reference because both the musicians are using loopers and other various forms of electronics with their acoustic instruments. All of the "audio reactive" visuals I've worked on in Resolume so far have been triggered by MIDI and I haven't actually done anything that's reactive to audio. Because we're going to be using live instruments instead of MIDI instruments, I looked up this video to try and learn the nuances between audio reactive triggers and MIDI synced triggers. Our group brainstormed about a project centered around wild mushrooms. Much of our time was spent finding bizarre species that we might want to portray in vignettes. We also spoke about including the different medical uses of mushrooms. I found a TED talk about the many ways we can use mushrooms as antibiotics. We also spoke about processing video of mushroom growth time-lapses as part of our visual component. We are hoping to use specific color schemes for each vignette, drawing influence from different fungi species and bioluminescence. Here's a video I found of a species of bioluminescent mushrooms in Brazil and how they interact with their ecosystem. I found the panorama at 0:31 especially beautiful. One visual component we also discussed involves video projection mapping. One goal we discussed would be to create a forest-like ecosystem in the Davis suite. Here's a video I found of some video projection mapping in a forest. We won't be performing the piece in a forest of course, but I found inspiration in the way these artists illuminated flora and fungi. I found this great performance of drummer Antonio Sanchez playing the live soundtrack (which he composed) for the film Birdman. We have been discussing about doing a live music performance with video screens on the background where we enhance and play with what’s happening on the screens. Unfortunately the audio gets distorted after the first 12-13 minutes. This is a scene from a film/documentary named Samsara, made by Ron Fricke and Mark Magidson and it relates to some of the themes we have been discussing for our project, but I also chose it because of its particular use of image and sound, this movie doesn’t have dialogues. In fact I didn’t like this video very much, but we have been discussing about having simultaneous video screens with different actions on each of them and in this video we can see simultaneous actions of hands scratching, touching and making different expressions. This is a live in-studio performance by the band ‘The Clouds Below’ performing their song ‘Waiting for Yesterday’. This performance has two musicians using instruments from different worlds and eras – the hammered dulcimer contrasted with the bass guitar for instance. In addition to the range of instruments in use (including MIDI keyboards), the musicians are also making use of more recent innovations such as trigger pads. Both musicians are multi-tasking - moving rather gracefully from instrument to pad to trigger. At times, they are playing two instruments simultaneously (one hand on each). Ableton Live is used for looping and layering and two MacBook pros are clearly displayed. The interface between two humans, ‘musicing’ with each other, using a combination of semi/traditional instruments but clearly also responding to the possibilities of the digital expanses mirrors to some extent the diversity and shared artistic threads of my team. Watching Reggie Watts is profoundly disorienting, inspiring and…hilarious (although one doesn’t always know why). I love the way he moves through different personas from stand-up to avuncular to professorial with music infusing and permeating his entire act (an altogether too prosaic a word for what we witness). His musicality is truly catholic (small c, in the universal sense) – and he channels it through a variety of mediums, fluidly moving between looped Sprechstimme, to McFerrinesque vocalizations and gleefully jumping behind the Nord Stage piano when the spirit takes him. I (and hopefully) my team might aspire to this type of ‘Big M’ musicianship, to the degree that our project emerges from the ‘dust of everyday life’ yet sparkles with artistic intentionality. This performance is from a TEDx performance at the University of Nevada. The performer uses a combination of instruments and vocals mediated through an effects processing/looping pedalboard. The interleaving of acoustic instruments with extended technique (tapping, percussive…etc.) and electric instruments is connected to our group members’ backgrounds in instruments from both worlds. The inclusion of the human voice via song appeals to my ‘hidden identity’ as a sometime poet and songwriter. The genre fluid approach is a match for my own omnivorous cultural appetite! In our group we had been talking about fungi and mushrooms as a source of inspiration for whatever work we would end up creating this semester. Vaclav Halek seems to have the right idea! Every day he finds wild mushrooms and composes new works essentially based on how they make him feel. He has been doing this for decades and is a very inspiring character. We also discussed color scheme. I found a video of a live show that Wilco performed in Brussels last year, and fell in love with concert itself as well as the colors that the lighting designer used throughout the show and the set itself. Perhaps we can explore set design as well. We also briefly discussed how costume design might come into play in our performance. I tried searching for a performance that incorporated some interactive costume. The first four minutes of this video proved to be interesting visually in many ways. What caught my eye though was how costume was integrated into the performance. I really only watched the first couple of minutes of this video, it is fairly long. Two different assignments wrapped into one post here. You now have a team and a bit of an idea of where you are headed. Search out at least three examples of work you didn't know about before that relates to the direction your team is headed. Feel free to take suggestions from your teammates in your search. Post the example with some substantive comment. Please don't just repeat something that your teammates posted in week 1. Consider this not just an exercise, but part of the essential process of researching your project. Here is a summary of our brainstorm/reflection on collaborations. Revisit these periodically. Feel free to suggest additions, too.